Well-respected Norfolk operators, the Nye family, who own the White Horse (see entry) and the Jolly Sailors in Brancaster Staithe along the coast, snapped up the stunning Kings Head in June 2016 and hit the ground running, quickly getting the place ship-shape for a seriously busy summer. Long a family favourite, this stately looking former manor house, set back from the road in acres of grounds, draws the summer crowds following a day at nearby Cromer or time well spent on Holkham’s magnificent beach. In keeping with its grand appearance, expect a country-chic feel and to feel immediately at home in the cosy, rambling bars and dining rooms, with much to catch the eye, from blazing fires in feature fireplaces, rugs on wood or tiled floor, old paintings and prints on warm Farrow & Ball painted walls, shelves groaning with books, unusual lamps and objet d’art, and an eclectic mix of old dining tables. 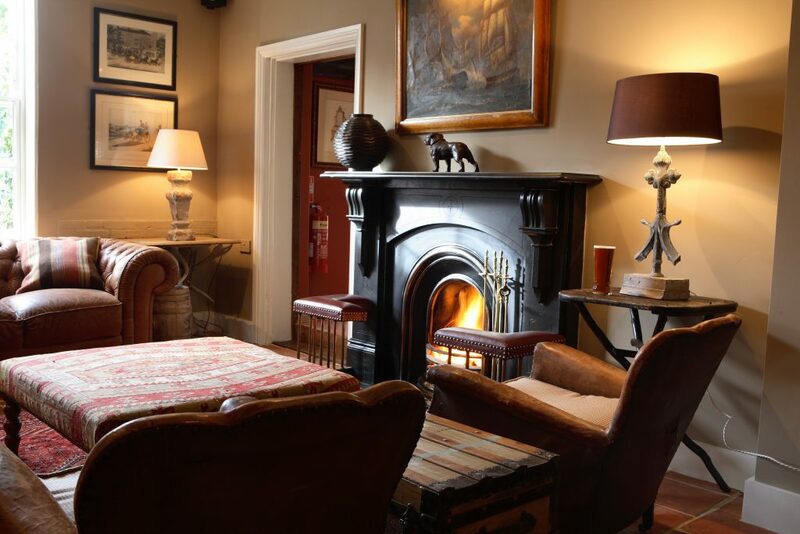 Hunker down on the leather sofa by the fire following a winter coast path ramble and peruse the papers with a pint of Adnams – bliss..! Dogs are allowed in the bars and welcome overnight in two of the double rooms at an extra £10 per dog – special treats for your pooch. The pub warmly welcomes families and children have their own menu (fish & chips; penne pasta) and the safe, enclosed garden and play area is perfect for youngsters to let off steam. Cots (£10) and an extra bed (£20) can be provided in one of the rooms. With teak tables and chairs on the sun-trap front terrace and a secret side garden, the Kings Head is the perfect place to rest and refuel after a day on the beach or walking the coast path. During the summer holidays the outside bar and BBQ in ‘The Shack’ is in full swing from noon to 8pm.